Are you or someone you know ready to upgrade to the ultimate level of geocaching? To be ultimate you have to have the essentials. There are many ways to get those essentials, but we found one really easy way: Get the Ultimate Essentials Pack! 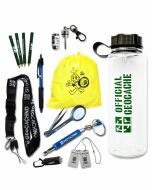 This ultimate pack combines the essentials for finding, maintenance and TOTTs all into a really cool Condor geocaching pack. Hit the trail prepared and essentialed!